Born: 17 October 1863, Leiderdorp, The Netherlands. Died: 31 July 1960, Pretoria, South Africa. P.J. Smit was the son of Joseph Smit, zoological illustrator at the British Museum (Natural History), and his wife Adolphina Plaat. The family moved to England in 1865, when P.J. was two years old. Following in his father's footsteps he started drawing and painting as a youth and showed such skill that he was soon asked to paint birds in the London Zoological Gardens to enable visitors to identify the different species. Later he illustrated reptiles, fish and birds for catalogues of the British Museum. Other plates by him were published in the Proceedings and Transactions of the Zoological Society of London, the Annals of the Genoa Museum, the Encyclopaedia Britannica, and G.A. Boulenger's* The tailless Batrachians of Europe (1897-1898). During the eighteen-nineties he painted most of the plates to illustrate the fish species found during a survey of the Congo basin, as well as plates for the Royal natural history (London, 1896) and Birds, mammals and reptiles of India. However, his most extensive work during this period was the illustration of the reptiles in John Anderson's Zoology of Egypt (London, Vol. 1, 1898). In connection with his work he travelled to Stockholm, Berlin, Brussels and Cologne. A notable feat by him was to compose a picture of the animal that was later named the okapi, based only on a skin, two skulls and a stuffed specimen in a Brussels museum, before any European had seen a living specimen. This picture later proved surprisingly accurate. Smit illustrated several works on South Africa and its fauna. The first of these was A naturalist in the Transvaal (London, 1892), by W.L. Distant*. He based these illustrations on photographs and they included a potrait of President S.J.P. Kruger and a view of Pretoria. In 1903, shortly after the Anglo-Boer War (1899-1902), Smit emigrated to South Africa and for some time worked for the Star Insurance Company in Bloemfontein. He was ordained as a minister of the Wesleyan Church in 1906 and subsequently served at the mission station at Bensonvale (Transkei), Brandfort (Free State), Cape Town, Winburg (Free State), Cathcart (Eastern Cape) and finally Robertson (Western Cape). During these years he retained his interest in painting, but found little time for it. 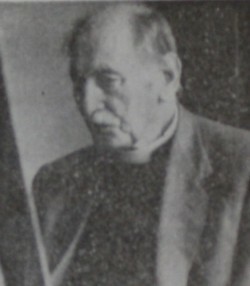 Upon his retirement in 1932 he settled in Port Elizabeth and resumed his art work, exhibiting pictures at the exhibitions of the Eastern Province Arts Society. In 1939 he started painting South African snakes and developed a special technique to obtain accurate reproductions of the scale patterns. The paintings were apparently requested by the toxicologist Dr John M. Watt of the University of the Witwatersrand. With the cooperation of Dr J.A. Pringle, Director of the Port Elizabeth Museum and Snake Park, who provided live specimens, he illustrated 105 species over a period of ten years. Many of these were later published in Snakes of southern Africa (Cape Town, 1962) by V.F.M. Fitzsimons. Pringle introduced him to Austin Roberts in 1942 and at the age of 78 he undertook to illustrate the latter's Mammals of South Africa (Cape Town, 1951), producing 24 colour plates and 230 figures over a period of several years. Smit was South Africa's best known zoological illustrator and continued painting to his death at the age of 96. His illustrations of mammals, birds and reptiles are amazingly life-like with regard to colours, textures and postures and constitute a remarkable record of South African animal life. During the early years he first made a rapid sketch of a live animal to capture its posture, before starting a detailed drawing. These initial sketches were later replaced by photographs, which he started taking as early as 1879, at the age of 15. In November 1963 an exhibition of his original sketches and paintings was held at the State Library, Pretoria, under the auspices of the South African Association for the Advancement of Science, to mark the centenary of his birth and celebrate his contributions to the illustration of our fauna. Smit married Gertrude Burge in 1894. Their only child, Bernard Smit, became an entomologist. First man to paint the unseen okapi. Scientific South Africa, December 1963, Vol. 1(2), p. 71. Pringle, J.A. Obituary: Rev. P.J. Smit. Southern African Museums Association Bulletin (SAMAB), 1960, Vol. 7(7), p. 151. Schoonraad, M. Sy kwas het die wetenskap gedien. South African Journal of Science, 1964, Vol. 60, pp. 97-98. Schoonraad, M. Sy kwas het die wetenskap gedien: Die werk van Eerw. P.J. Smit. Lantern, March 1964, pp. 77-81. Smit, B. The illustration of zoological literature at the British Museum in the nineteenth century. South African Journal of Science, 1962, Vol. 58, pp. 65-68.